Home EntertainmentHolidaysChristmas	Imaginext DC Super Friends Super Hero Flight City – Kindergartner Approved! I hope I am never too old to play with toys. I’ll admit one of the most fun perks of being a mom is acting like a kid again! 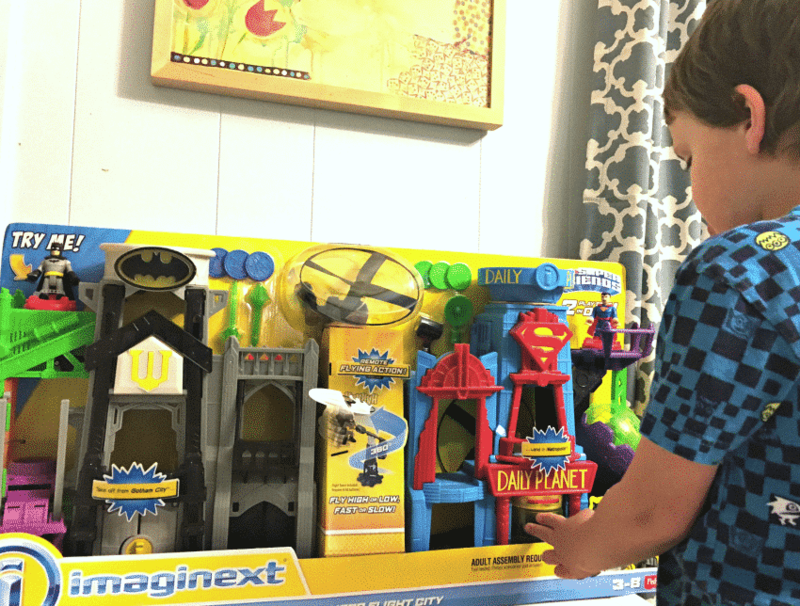 We’ve been window-shopping for toys this holiday season to get an idea of what the boys like and when we had the chance to check out the Imaginext DC Super Friends Super Hero Flight City play set, I knew my super hero loving kindergartner would love it. And I was right! This is a great “big gift” for the holidays because not only is is large in size, there’s tons of fun with this toy! 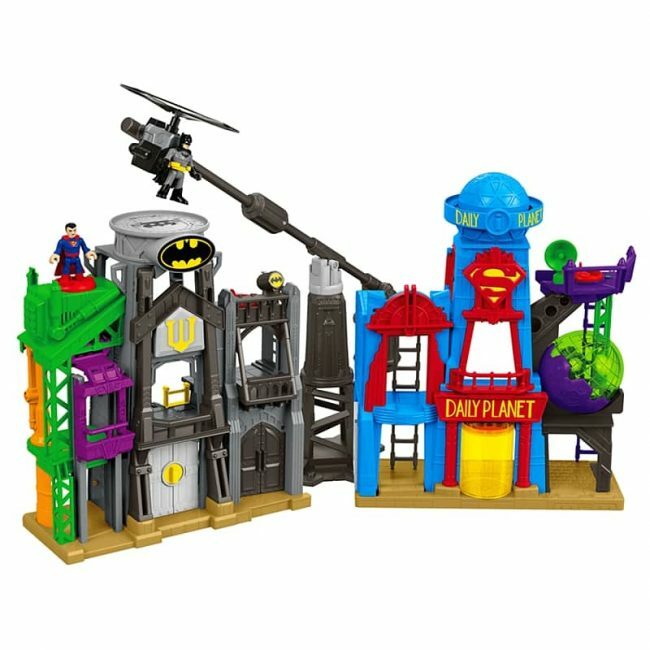 The set comes with both Batman and his Bat Cave as well as Superman and the Daily Planet. The sets can hook together or be played with apart. The coolest feature though is the battery operated flight suit! Both figures fit into the cool copter and off they go in 360 degrees! My boys immediately wanted to fly them from Gotham City to Metropolis and we had fun trying to time it just right so they could land on top of the buildings. This year, Calvin is in kindergarten and learning all the skills that come along with it. Our school has a super hero theme for the year so as you might imagine, Cal is all over it. Recently, he was getting frustrated with his sight words and starting to have a meltdown. We weren’t sure what to do to help him through it and then I remembered his super power. I told him that he has his own super power just like his favorite heroes. He might not have laser eyes or be able to fly, but he can learn to read. Reading, I told him, will give him the power to learn almost anything he wants to learn as he grows older. Now as we work on his reading and writing, he likes to be reminded of his very own super power! I love how even something as simple as a toy can be used to encourage learning. Since we don’t have any bad guys yet, we had a little Batman vs. Superman fun with the new play set. Check it out! 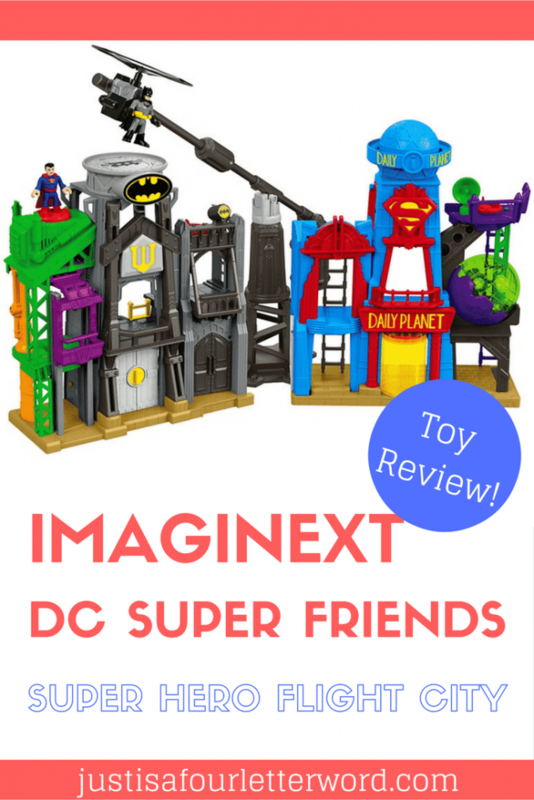 We had so much fun checking out the Imaginext DC Super Friends Super Hero Flight City play set! I definitely see more epic battles in Metropolis and Gotham City this year. If you liked this review, please share it! And if you have any questions, feel free to chime in with a comment below. Disclosure: We received the above product for the purpose of this review. All opinions are my own. Post contains affiliate links.